Sinai Tots is a parent-child experience that includes hands-on Jewish learning, community-building with other families, and of course, FUN! The class meets monthly to explore Jewish holidays and values through stories, songs, art, games, cooking, and more. Our PreK class is all about Jewish fun and new friends! 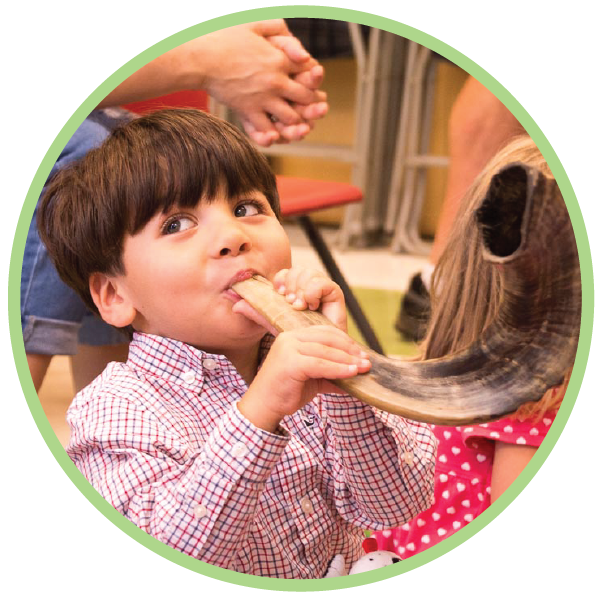 The curriculum focuses on Jewish holidays, which children explore through art, music, stories, games, and more. They also spend time getting to know each other and discovering what it means to be part of a Jewish community. This is a great way to help your child form connections and create fun memories before entering Kindergarten. Once a month, Tot Shabbat gathers families with children ages 5 and under to celebrate Shabbat with a fun, kid-friendly service. It is always special to see our little ones singing and dancing with the joy of Shabbat. The service, typically themed and led by one of our clergy (sometimes in costumes) is engaging for everyone. Join us for Tot Dinner Club before the service with crafts and social opportunities to connect with other families and is followed by an oneg and craft related to the theme. Join other dads of kids ages 5 and under for a laid back get-togethers throughout the year! From playground time to pizza and ice cream to visits to the Fire Station it’s always guaranteed to be so much fun. We invite you and your little one to join us for a weekly Baby and Me music class and playgroup! Each session will begin with a fun and interactive music class with Ms. Lauren followed by play time with friends on the playground. There is no charge for this class.